So last week, at their request, I penned a special guest entry for RollBamaRoll‘s “RBR Reading Room” series. 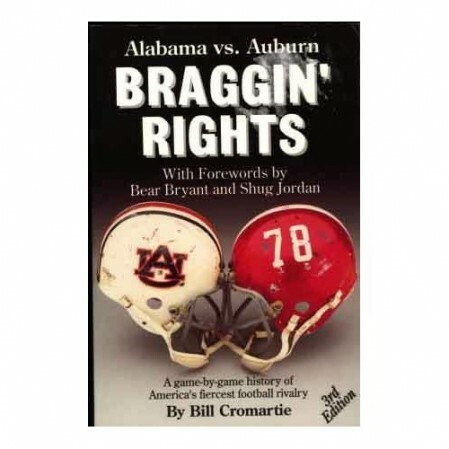 I reviewed the book Braggin’ Rights: Alabama vs. Auburn by Bill Cromartie, and my post went live over there yesterday. I’d suggest clicking over, but if you want the short version: Braggin’ Rights is terrific as a handy Iron Bowl reference guide, chockful of fun little tidbits from the early days of the rivalry and classic quotes and photos, but a bit of a slog as a start-to-finish read. Great book to have around, especially if you’ve got any interest at all in the series’ history, but just don’t expect to be blown away if you’re reading it in one shot. Auburn ! ! ! ! ! ! All punctuation is reproduced verbatim. Which is why my favorite part of this is a perfect tie between 1. “Preck-a-ge-gex” 2. the six exclamation points after “Auburn.” I don’t know how you vocalize those, but I bet the good Plainsmen of 1893 found a way. 2. At attention. The book did little to change my general grudging dislike of Bear Bryant–it makes clear just how far back the “cow college” snobbery goes amongst the Tide rank-and-file, but to have it endorsed by the head football coach himself still strikes me as awfully petty–and no doubt, he seemed to take a particular, even exuberant joy in beating Auburn. Bryant looked up at Jordan. Then Bryant stepped back. And then he saluted. Bryant of Alabama hasn’t had much practice, but he can lose with grace, like he wins with grace. [OK.–ed.] And if he died a little on the inside, Legion Field at 4 o’clock on Saturday afternoon wasn’t the place to show it. Four times in a row, he had been a happy winner. Now, it was Jordan’s time. — Auburn scored on an 84-yard fake punt touchdown run by Connie Frederick, Alabama on a 102-yard kickoff return. Insane. It’s easy to point out, of course, that Pat Sullivan was at the helm of that Tiger offense and only a year away from winning the Heisman, but even Sullivan-to-Beasley took a back seat that day to Wallace Clark (117 yards, 3 TDs), Micky Zofko (74 yards), and the rest of the Tiger rushing attack. You’d think the Tide quarterback who’d managed to throw for almost 500 yards in the Iron Bowl would be a household name, but he wasn’t any of the legendary Tide QBs who would go on to be NFL stars–it was a kid named Scott Hunter. I’m sure the Tide fans and older Auburn fans are plenty familiar with Hunter’s name … but I will admit I was not. Since we’re Auburn and we can never have enough nicknames, here’s a vote for occasionally referring to our teams as “Technic Shop Hands,” just for the hell of it. — Alabama had won the previous year’s matchup 55-0. But Johnny Wallis (on a pick-six) and George Davis scored touchdowns, Bill Tucker converted both point-after attempts, and Auburn won anyway. LOL. Just goes to show you what the pregame dope is worth. I hope they’d have re-used that one if Auburn had won last fall. They probably wouldn’t have. Waitwaitwaitwait wait wait wait wait, wait, wait, wait, wait… wait. You’re telling me the people at RBR can READ? General grudging dislike of Bear Bryant!!! I take back everything praiseworthy I said about you! I kid. I wasn’t serious when I said any of it anyway. Thanks for popping in at Roll Bama Roll with the book review. It was a great effort and hopefully underscores the one point we both agree on about the series… it’s IMPORTANT. And, every so often, it’s worth reminding ourselves why. Another great book to check out is, “The Uncivil War: Alabama Vs. Auburn, 1981-1994.” It was co-authored by two of my favorite people, Will Collier (who also writes the ‘From the Bleachers’ blog: http://fromthebleachersblog.blogspot.com/) and Scott Brown. Totally, Xavier. I’m certainly not endorsing this book as some sort of end-all, be-all; it just happened to be the book Kleph asked me to review. My grandfather was at the 48 and 49 games while he was a student. Over 50 years later he would still talk about bama missing that extra point. I was at the ’69 game, my fourth. After the beatdown in ’66, the heartbreaker in the tornado in ’67, and the second heartbreaker in ’68, the win was an unbelievable catharsis. To watch our boys hang 49 on Bear’s team (I must admit I booed with the rest when Shug didn’t go for two after Frederick’s TD) is still one of the greatest college football experiences of my life. By the way, Sullivan was only a sophomore that year; the Heisman was two years away. I grew up hearing from my dad about the 49 Iron Bowl and how the API students spent several hours tearing up stadium cushions at Legion Field afterwards.